WE RECOMMEND THE THINGS TO BRING. BE A MINIMALISTIC. WHILE BIKEPACKING THE GEAR SPACE IS LIMITED AND YOU’LL APPRECIATE THE ULTRALIGHT SETUP ON THE HILL CLIMBS. LESS IS MORE. • (money, credit card). Remember to tell you bank that you will be in Vietnam and Laos, so your card won’t be blocked. • Passport (with 1-month multi-entry Vietnam visa). Don’t worry about Laos we cover that visa cost on the tour. Knowing the bike is already setup and ready, only thing to add was my spare clothes, wash kit, some personal meds and my passport with online multi-entry visa in Vietnam, which was easy enough to get. Here is the link they suggested to me. When you arrive at immigration don’t go straight to the line like I did. After queuing 30 minutes I handed my invitation letter (printed out from email pdf), the officer told me to go and fill in form then had to re-queue again lol. Once you arrive, fill the arrival form, then go to “Visa On Arrival”, hand them your invitation letter and obtain your visa, then get in passport control line. You save a lot of time. As per my own experience with other travel companies in Asia, I’ve budgeted $20 a day knowing everything is included. However, I’ve spent only few dollars on sunglasses and on the colored pencils for the local kids presents. By near end of the trip I realized I had barely spent anything of my budget. As when they say everything is included they mean it. So, I picked up some hand-made local dresses in one of the village as gifts for my wife and two daughters and still had plenty cash left over. 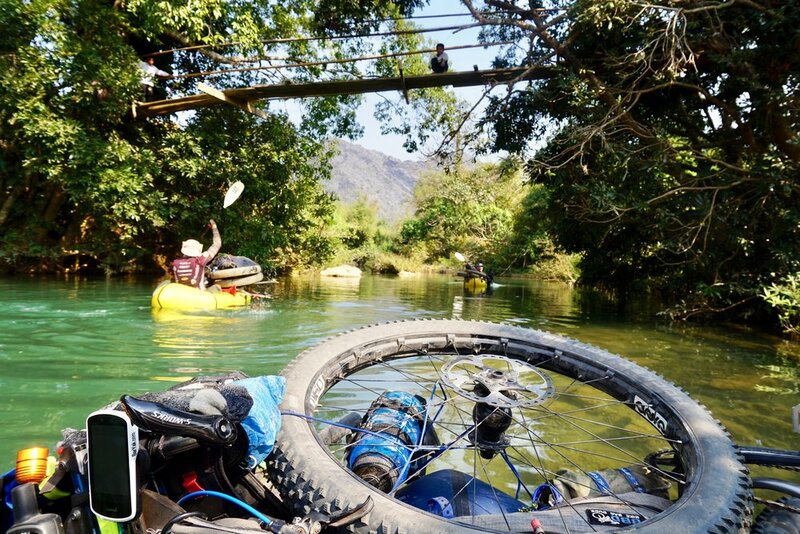 Ensure you taking minimum gear on The Ho Chi Minh Trails tour as the bikepacking setup already includes all necessary gear, except your personal clothes. Left my suitcase in the first hotel before jumping on the bike and picked it back up when arrived without any charge. Fitness level was not so critical as I thought I cycle a few times a week, however sun exposure was well underestimated and kicked me. Unfortunately, I forgot to bring arm covers, but it was easy enough to find those on the local market for couple dollars the night before we left on tour. Just make sure you read the preparation checklist before flying out. And drink lots of water on the trail. What is included on your Ho Chi Minh Trails tour package. THE SHORT ANSWER IS "ALMOST EVERYTHING." Single supplement. Every customer gets his own exclusive suit at the Novotel 5-star, Da Nang.